Being stuck in a guard booth all day long can be tedious. Poorly designed booths can diminish alertness and cause both physical and mental health problems for employees. 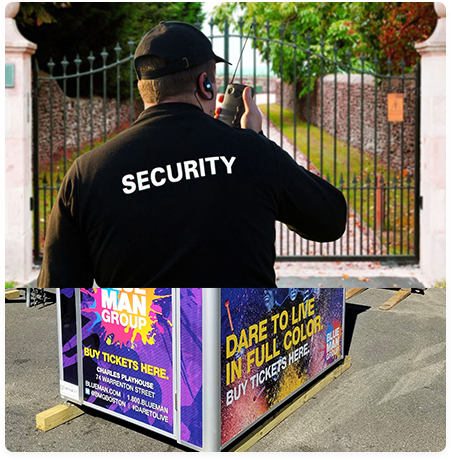 Using a properly designed booth for your security guard, parking attendant, or ticket salesperson that maximizes natural lighting provides a myriad of health benefits. In addition to providing an enhanced views for better visibility, natural lighting has a variety of health benefits to improve quality of life for employees. Natural light exposure in workers has been shown to improve alertness, quality of life, and sleep quality according to a study by the University of Illinois and Northwestern Medicine. Guardian Booths come with a variety of options for maximizing natural light, and also includes the option of tinted windows that let light pass through but provide increased privacy while also reducing heat absorption. 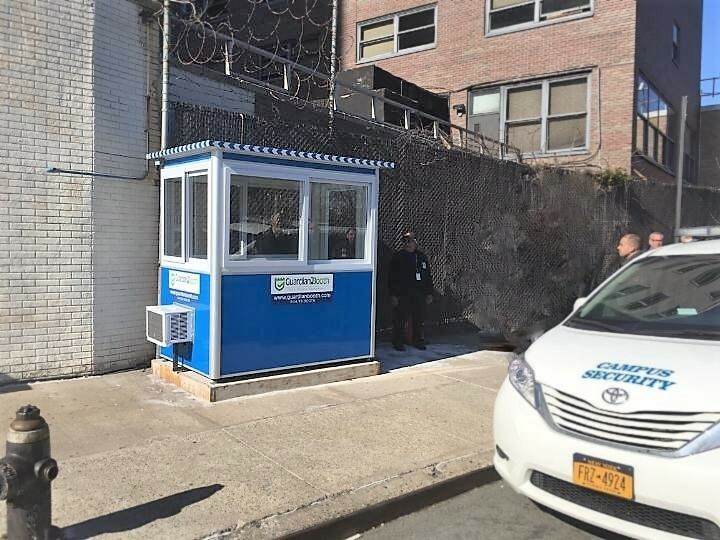 Security officers stuck in a small guard shack or parking attendants in a vale booth can sometimes face extended periods of inactivity. By increasing natural light during the day which provides better sleep quality at night, workers are less likely to be drowsy while on duty and more alert at their job. The study shows that workers exposed to natural light also tended to be more active and physically fit. In addition, natural lighting effects showed an increase in worker activity and productivity. Miriam Munch from the Swiss Federal Institute of Technology said light has a perceptible impact on non visual functions, such as alertness, mood, and performance. Natural light increases productivity. “Lighting conditions are likely to significantly contribute to modulation of alertness and productivity,” Munch said. The U of I/Northwestern study highlights the importance of natural light in the workplace. 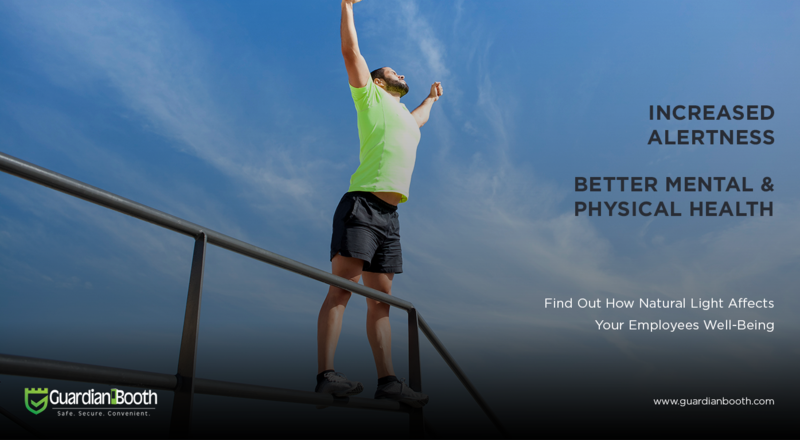 Workers exposed to more natural light during work hours tended to exercise more and engage in more physical activity, which can lead to increased levels of alertness. Abraham Taub a veteran paramedic worked many night shifts throughout his career and spent a lot of daytime shifts in poorly designed booths at first aid stations. “I can tell you about all the negative effects associated with lack of exposure to natural light,” Taub said. He learned first-hand the most pronounced benefit of natural light is its calming and peaceful effect on moods. Together with his long-time friend Abe Breuer who shared similar experiences as a veteran Emergency Medical Technician, Taub and Breuer co-founded Guardian Booths. 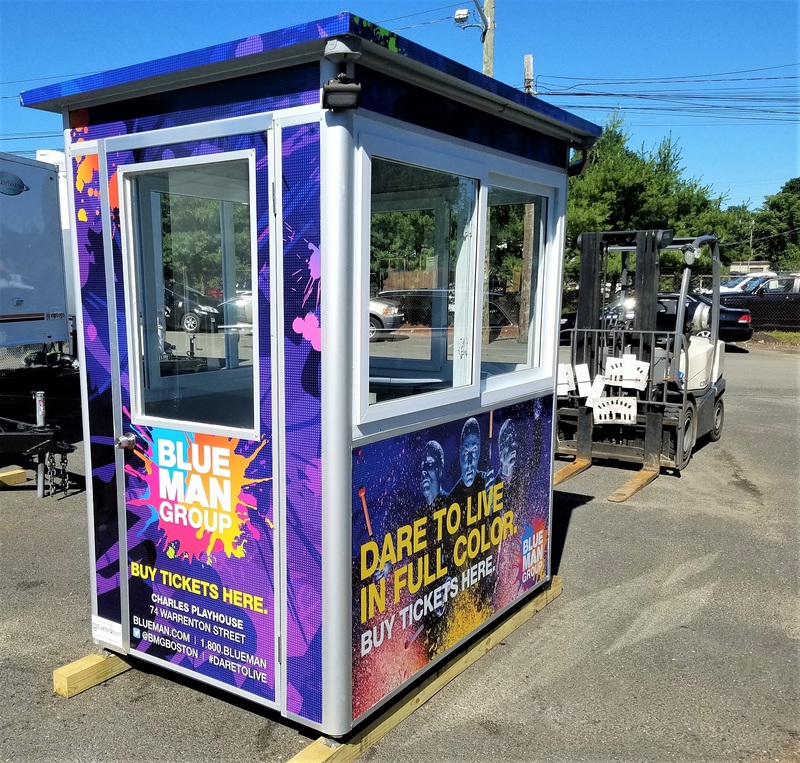 “One of the reasons we created Guardian Booths was the lack of natural light in booths offered by competitors,” Taub said. Before starting Guardian Booths, Taub and Breuer used to contract with other companies for their guard shacks. Customers always complained about the lack of windows. Taub made it his mission to design a booth from the user perspective with the most possible windows for natural light and 360-degree visibility. Windows providing natural light have a significant impact on sleep patterns. The study shows that workers that spent time in a workplace setting with windows providing natural light slept 46 minutes a night more than those that didn’t. Other studies, including those published in the Journal of Clinical Sleep Medicine, show that windows provided a 173% increase in white light exposure during work hours. White light (or natural light) exposure provided for increased sleep quality. The body craves routine, but adapts to its environment. The natural cycle of waking and sleeping can be disrupted by a lack of natural light during daylight hours. Working without natural light can cause the body to produce additional amounts of melatonin – the hormone that helps us fall asleep. Natural light inhibits melatonin production, which helps shake off the drowsy feeling. “Light during the natural daylight hours has powerful effects on health,” Zee said. “People who get more light during the day may sleep better at night, which can also help improve health,” Zee cited as one of the health benefits of natural light. Sleep plays a critical role in overall health. The human body fights infection while at rest when energy can be utilized in fighting the infection rather than other functions. A good night’s rest can help reduce illness and help the body repair. Stress plays a major factor in health and healing. Increased stress causes increased levels of the hormone cortisol. Cortisol production is reduced during sleep to allow the body to rest. Lack of sleep can play a key role in fatigue and depression. Working in a windowless office can prohibit Vitamin D production. Natural sunlight increases the body’s absorption of Vitamin D, which is known to help immune systems stave off disease and fight off depression. Increased natural light also has financial benefits for employers. end with the user in mind. 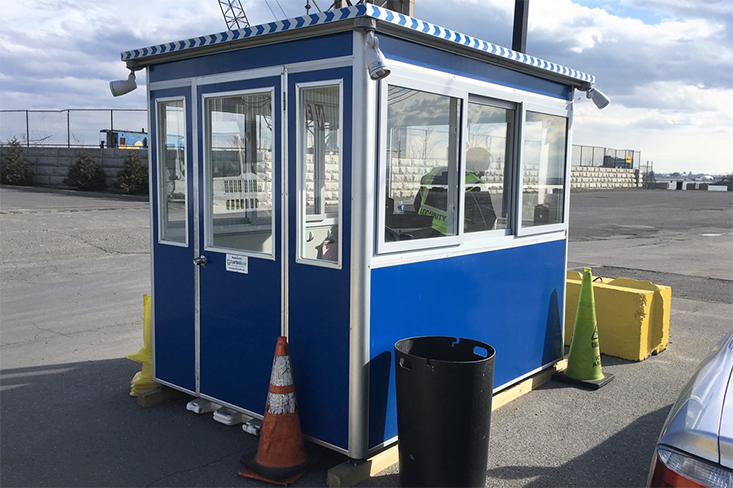 We can help you make a good decision about what type of guard booth, security enclosure, parking booth, or ticket booth you need. For pricing information or for more information, visit our pricing page or contact us directly. Why is Natural Light Necessary? Natural light in the workplace is necessary for better mental and physical health. This includes increased alertness, better sleep quality and financial benefits. What are the Health Benefits of Natural Light? What are the Effects of Natural Light in the Workplace? Better sleep. One study shows that workers that spent time in a workplace setting with windows providing natural light slept 46 minutes a night more than those that didn’t. Other studies, including those published in the Journal of Clinical Sleep Medicine, show that windows provided a 173% increase in white light exposure during work hours. White light (or natural light) exposure provided for increased sleep quality.